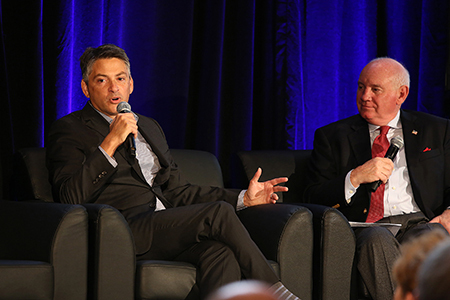 Realogy Franchise Group President and CEO John Peyton discusses his vision with RISMedia President and CEO John Featherston at RISMedia’s 2017 CEO Exchange. It’s not often that we get the chance to view the real estate industry from an outside perspective. 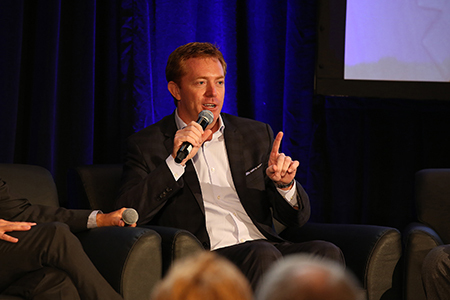 But when John Peyton—Realogy Franchise Group’s new CEO—and Nick Bailey—president and CEO of Century 21 Real Estate LLC—took the stage for a candid fireside chat with RISMedia’s President and CEO John Featherston, that’s exactly what attendees of RISMedia’s 2017 CEO Exchange got. Taking place at the Harvard Club of New York City on September 12 and 13, the more than 230 real estate brokerage leaders and C-level executives in attendance were provided a unique lens through which to view the current state of the industry—and the future as it continues to unfold. John Featherston: Please tell us a little bit about yourself and what you’ve done prior to coming to Realogy Franchise Group. John Peyton: I spent 28 years at Starwood Hotels & Resorts, working in a number of marketing/branding and operations roles, in addition to serving as COO of Starwood’s North America Hotel Division. I finished up my time at Starwood as CMO before joining Realogy Franchise Group as president and COO in October 2016, where I stepped in as then-CEO Alex Perriello’s apprentice. When Alex decided to retire earlier this year, I succeeded him as president and CEO. JF: Coming from outside the industry, what would you say we’re doing well, and what are we not doing so well? JP: The biggest takeaway for me thus far is the fact that we’re living in an age of great change, which is not unique to the real estate industry itself. Today, it’s all about technology, the availability of data and the empowerment of the consumer. This is an industry that’s not afraid of change, and that’s a key ingredient in the recipe to success. The real estate industry is full of incredibly strong brands, whether national, regional or local. As a franchisor in the hotel industry, our partners were other large public companies, and I didn’t anticipate until I got here that this industry is about entrepreneurship, or family-owned, multi-generational businesses. There’s a true sense of family, a desire to win, a focus on every dollar and every person mattering that I didn’t experience in the larger corporate environment from which I came. The personal intensity of ownership within this business—and the tie to community—has been the biggest learning curve for me. JF: What lessons can we learn from so-called disruptors such as Airbnb and others? JP: While Airbnb is a great story, it’s not a good story for hotels. 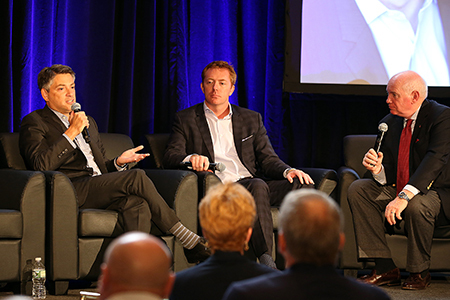 Looking back on a CEO panel held five to six years ago during our yearly industry conference, each and every member of the panel noted that Airbnb was not an issue, was not on their radar, and wouldn’t affect the industry. When the topic was posed a few short years later, those same CEOs all admitted that they missed it. From my perspective, we missed the consumer insight that Airbnb was responding to. Airbnb knew that following the recession, the affluent didn’t just want stuff anymore. They wanted legitimate, authentic experiences, and the hotel industry missed that. Paralleling the real estate industry, Opendoor is a good example. While I can’t speak to whether or not they’ll be successful, the insight here is that homeowners are willing to sell their house at a discount if they can avoid the hassle of the process. Solving this begins with worrying about the insight they’re chasing, and how we’re responding to it. JF: You’ve been charged with running an iconic brand. What can we expect as far as branding in terms of changing the overall impact of Realogy Franchise Group? Will there be a focus on millennials or other specific demographics? JP: First and foremost, millennials hate being called millennials. When it comes to working with and interacting with consumers in this demographic, it’s important to think of the millennial as a person, rather than a group. As far as branding, as CMO at Starwood Hotels, I was trained to think about brands in a fairly structured, processed way. A brand is a promise, and whether it’s at the national, regional or local level, you must be clear on what that promise is. We call this the value proposition, and we must be consistent with it. A strong brand should be different, better and special. When it comes to new programs, products or training, it’s important to determine whether what’s being offered is different, better and more special than what others are doing. Not only must everything communicate, but there has to be 100 percent consistency in the visual product, office design, the way phones are answered, etc. In the end, strong brands deliver functional, emotional and societal benefits. JF: What is your outlook toward various portals/relationships, and how does Zillow fit into the mix? JP: Being new to the industry, I’m surprised at the industry’s level of criticism toward Zillow. What’s most surprising is the criticism from a practical standpoint, because Zillow isn’t going away. The phenomenon of Zillow isn’t unique to our industry. Consumers in 2017 are empowered because of mobile, internet and the amount of data available to them. We need to focus on embracing Zillow as a partner, understanding how we want to be successful as we work with them. That being said, I do agree that we need to be careful and thoughtful. How can we maximize our performance versus worrying about it? The hotel industry lost control of its product. We know we can’t do that. Instead, we must learn to work with Zillow and other portals as equal partners. John Featherston: Nick, congratulations on your recent appointment as president and CEO of Century 21 Real Estate. What’s it like being back where it all started? Nick Bailey: Being elected president and CEO of Century 21 Real Estate LLC is like coming home for me, since I got my real estate license with Century 21 when I was 21 years old. I began buying commercial real estate when I was 17, purchased my first home at 18, and knew I was going to be in real estate forever. Today, there’s a lot of noise in the industry, but I hope to use the platform I’ve been given to bring clarity to the organization. Century 21 has an awesome foundation—we just need someone to blow the dust off of it. JF: Looking out over the next three years, what’s in store for the Realogy brands? NB: A big reason for my decision to join Century 21 is the brand’s vision, and I’m excited to take that experience and make it translatable to the industry. We have the opportunity to take an iconic brand and make it relevant, fresh and innovative. At the end of the day, it’s important to remember that an agent still joins a company because of its leadership; in fact, it’s all about leadership. JP: Nick truly personifies the brand’s future, and this was the rationale for recruiting him as hard as we did. We believe agents are the past, present and future, and those who embrace technology will be the ones who find success. Bringing in someone with Nick’s perspective is what we need at both Century 21 and Realogy to make sure we remain focused. One of the biggest changes path forward will be our focus on the agent. In fact, it’s our mission across all five brands to ensure our agents are as productive and profitable as possible. NB: There’s a true consumer movement out there, and we have to stay in front of it and embrace it. I can’t say enough good things about Zillow Group. While we started with MLS books, I believe the industry is in the midst of an MLS book hangover. It’s all about transparency today. Agents and consumers can sometimes collide (think the Zestimate), but if consumers want it, every brokerage and franchise network should have a similar tool. Consumers are voting with mouse clicks, so we need to focus on bringing worlds together even where they collide.